Sugar is yes delicious, but it is dangerous to your body, of course on the long term, if you know how sugar threatens your health, you will never feel the same about it. Check out how your body is telling you that you may be eating too much sugar. This is one of the signs that you are eating too much sugar, when you eat sugar you get a temporary boost in your energy but the crash that follows is undesired, if you are feeling tired all the time and you are not consuming much sugar, then reduce the amount of simple carbohydrates from your diet as they also get transferred into sugar quickly in your bloodstream. You may have become addict to sugar if you are getting cravings for sugary snacks and carbohydrates everyday, sugar is addictive because it activates the reward feeling in the brain so consuming it more often can get your body to often require it in order to feel good. If you notice at you are getting colds and flus often or other diseases and infections that last longer than normal or than you are used to then that can be blamed on your sugar-rich diet, sugar weakens the immune system and breaks down the white blood cells that are responsible for creating antibodies to fight any foreign sickening microorganism that attacks your body. – Foggy Brain, Especially After Meals. Foggy brain, lack of concentration and cognitive impairment are all signs of low blood sugar levels, when you eat plenty of sugar, your blood sugar levels spike very quickly then drop again very quickly which makes you feel tired and lack concentration. – Everything Tasted Sweeter Before. When you eat too much sugar regularly, your taste buds become very tolerant to the taste, which makes you want more and more sugar to satisfy your sugar cravings, if you reduce your consumption of sugar then gradually your tolerance will go down again and you will feel delighted to eat anything sweet, you may even start feeling that foods are too sweet for you. – Skin And Feet Problems. Sugar has inflammatory effects so when it is consumed often specially if it is floating around in the bloodstream, this can inflammation in the skin so if you are suffering from acnes, eczema, rosacea excessive oiliness or dryness then you can blame that on your sugar consumption. In addition, too much consumption of sugar cause inflammation effect on your feet in the form of plantar fasciitis where you will have pain in the thick skin tissue surrounding your feet. Moreover, excessive sugar consumption also cause adrenal fatigue, one of the signs of adrenal fatigue is dark circles around the eyes. Last but not least, consuming sugar lead to weight gain very quickly, sugar contains no fiber, protein or nutrients, it is only plain calories that triggers your weight and energy levels, if the sugar that you consumed doesn’t get used as energy then it will all get stored as fat cells which lead to weight gain and it is almost impossible to burn the sugar you get from one donut or one cookie in just one day unless you exercise really intensively. Sugar wont make you feel satiated so your body will call for something to eat soon after consuming sugar which is another thing that cause you to put on weight. 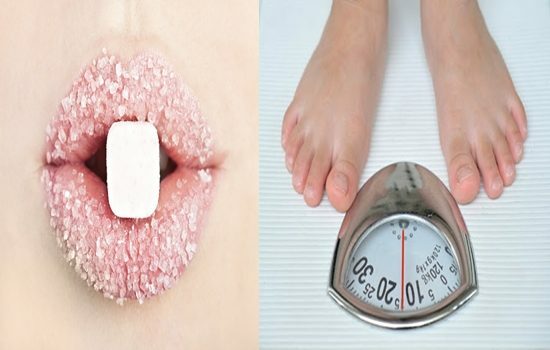 Once you stop eating too much sugar you will find that you health is improving significantly, your skin will look better, you will have more energy, you will get sick less time and for sure you will be able to manage your weight. PEPPERMINT TEA – DO YOU KNOW THE HEALTH BENEFITS OF PEPPERMINT TEA?